A coalition of human-rights concerned politicians from across the region on Friday called on governments throughout Southeast Asia to end the increasing number of assaults and abuses of media workers throughout the region. 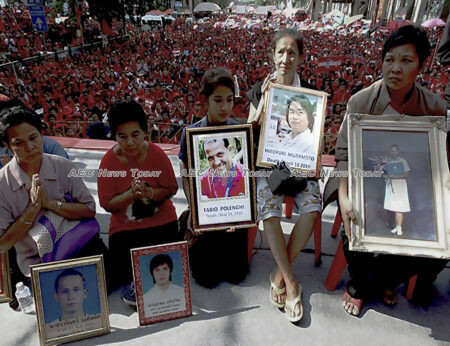 In a statement issued to mark ‘International Day to End Impunity for Crimes against Journalists’ on November 2, Asean Parliamentarians for Human Rights (APHR) warned “that a culture of impunity for killings will only embolden more attacks on journalists, who play crucial roles in holding power to account and bringing information to the public. It is abhorrent that brave journalists should have to put their personal freedom or even lives on the line when they are simply trying to do their jobs,”, said APHR Board Member Teddy Baguilat, a member of the Philippines House of Representatives. Between 2006 and 2017 more than 1,000 journalists were killed globally, a recent report by the United Nations Educational, Scientific and Cultural OrganiSation (Unesco) found. According to the report author’s, in nine out of 10 cases the perpetrators never faced legal prosecution. In the first nine months of 2018 at least 88 journalists have been killed, while thousands of others have been abducted, harassed, detained, attacked, silenced, or jailed on false charges; frequently without proper procedure. This trend, according to UNESCO, has substantially increased since 2012. To raise public awareness of the injustices meted out to journalists globally, UNESCO has launched a new campaign tagged ‘#TruthNeverDies’. Media organisations and journalists are being encouraged to help raise awareness with an online toolkit containing a variety material in Arabic, English, French, Italian, Portuguese, and Spanish. Publications are also encouraged to republish work by journalists who have been killed carrying out their profession, or about them. Assaults on media freedom are an increasing problem throughout Asean, paralleling the rise to power of strong national leaders with little regard for matters of transparency and good governance when it suits them. As democratic space across the region has continued to shrink, so too has freedom of expression and the voice of independent media been constricted. Widely interpretable laws backed by harsh penalties and courts willing to convict, even in the absence of — not even credible — evidence, reminders to those in the media and their audience of the ‘occupational hazards’ journalism operates under. Most recently this was highlighted with the trials of Australian documentary maker James Ricketson* in Cambodia, and Wa Lone and Kyaw Soe Oo in Myanmar. Fear is also a powerful weapon. A female journalist from one Asean-member country once recounted a story of coming home and finding all of her jewellery and valuable items laid out neatly on a table. Nothing had been taken. No note had been left. Nothing had been disrupted. But the message was clear. Someone who she didn’t know wanted her to know that they knew where she lived and could easily enter her home, despite its intruder alarms. While jail cells and court rooms have largely replaced the bullets, brass knuckles, petrol bombs, and hand grenades in the middle of the night that some who work in Asean media have feared in the past, physical threat is by no means a relic of the past in a region awash with war weapons. As some regional leaders follow the example of the US President and label stories that they don’t like as ‘fake news’ and accuse the media of divisiveness, it is unsurprising that reports of physical assaults and legal intimidation against and of journalists going about their work are rising. With a rank of 133 out of 180 in the Reporters Without Borders’ World Press Freedom Index 2018, the Philippines is the most dangerous place in Asean for a journalist to work. The killer of a journalist in the Philippines is also likely to get away with the crime. The Committee to Protect Journalists’ (CPJs’) Global Impunity Index 2018 ranks the Philippines as the fifth of 13 countries globally for the number of unsolved journalist killings since 2008. 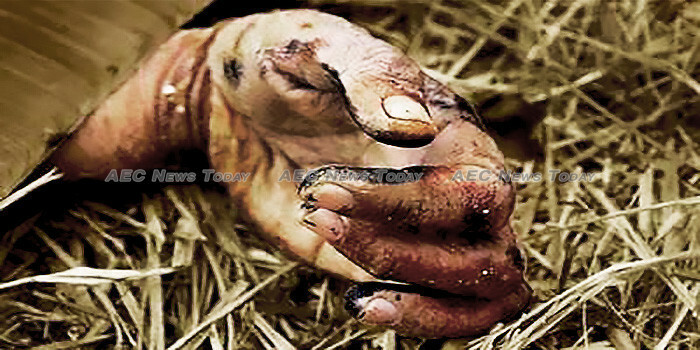 Most infamously was the 2009 ‘Maguindanao massacre‘ when at least 34 journalists were killed. The first two years of the Duterte administration has seen no let-up in journalist deaths. 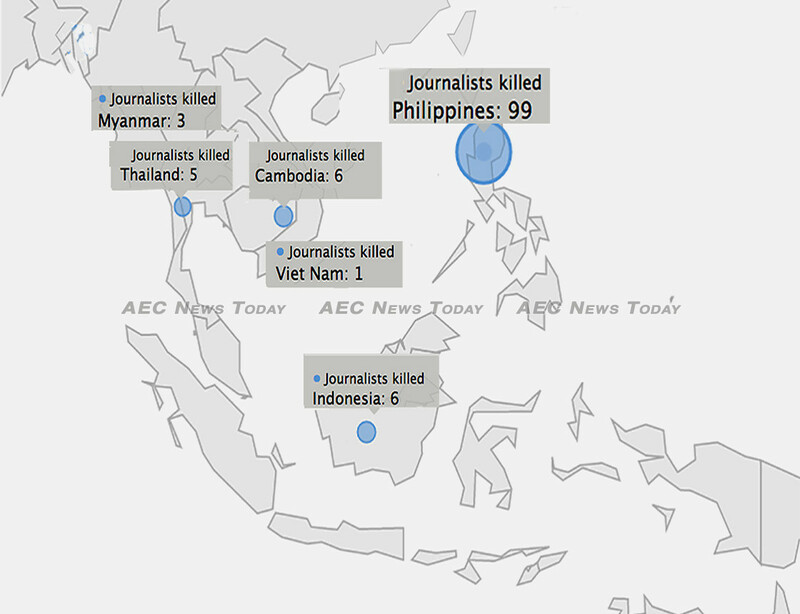 The National Union of Journalists Philippines (NUJP) says some 12 journalists have been killed over the period. No one has been prosecuted for any of the deaths. Philippine publications such as Rappler, Philippine Daily inquirer, and ABS-CBN who have aggressively criticised the Duterte administration’s ‘war on drugs’ and accompanying ex-judicial killings have found themselves subject to intense government legal scrutiny, discrimination, persecution, and prosecution. In Cambodia, ranked 142 by Reporters Without Borders, a similar focus on compliance, governance, and regulatory matters saw The Cambodia Daily shuttered, and The Phnom Penh Post sold. 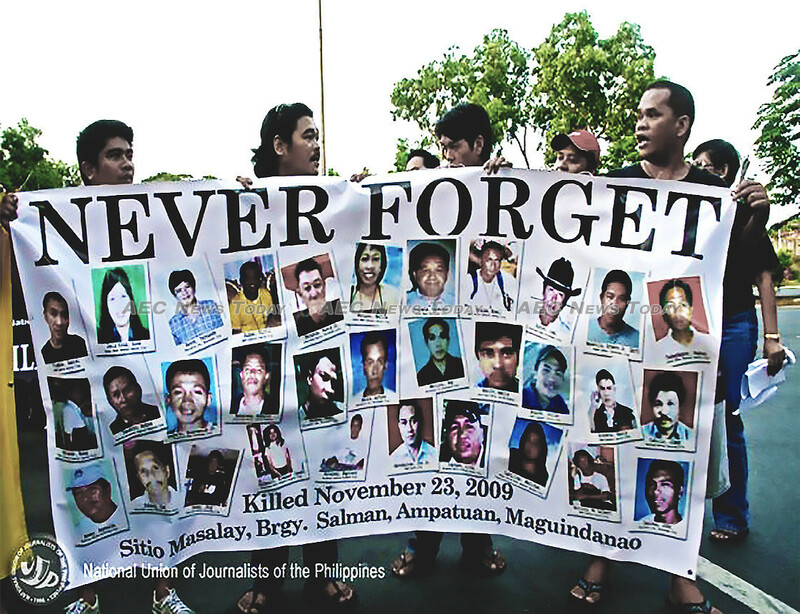 Of the 13 journalists killed in the tiny kingdom since 1994, those responsible for 11 of the deaths remain free. In a statement signed by 33 NGOs to coincide with International Day to End Impunity for Crimes against Journalists, the Cambodian Center for Human Rights (CCHR) called on authorities to facilitate efforts to end the menace of impunity in the country. While EU and US trade negotiators might be willing to overlook the abuses carried out against journalists and bloggers in Vietnam, Reporters Without Borders and the CPJ aren’t. Thuggery and fear of lengthy jail terms for those who upset the ‘state-stamped’ version of events with details such as proof, facts, and evidence have seen the nations bloggers and journalists grow increasing frightened and circumspect. The World Press Freedom Index 2018 ranks the country a lowly 175 out of 180, while the CPJ describes Vietnam as one of the world’s worst jailers of journalists. At least 16 Journalists and bloggers have been jailed there since 2016 (See: Vietnam lectured, Cambodia sanctioned: blogger jailings highlight US double standards (video)). Also joining the bottom feeders on the World Press Freedom Index 2018 is Lao PDR with a score of 170, Singapore with a score of 151, and Malaysia with a rank of 145. In Thailand where 10 journalists have been killed since 1998, civilian and military authorities (they always travel together) continue to keep a tight grip on just how much information people are allowed to learn. Events at universities and the Foreign Correspondents Club of Thailand (FCCT) on topics deemed sensitive or likely to cause confusion or unrest if spoken about have been shut-down before even starting by large squads of soldiers and police. The Chan-o-cha administration has been particularly reluctant to address the 2010 deaths of Italian freelance photographer Fabio Polenghi and Reuters camera operator Hiro Muramoto (along with more than 100 anti-government protestors) with any form of transparency. It was ranked 140 out of 180. Ranking the highest in Asean on the 2018 World Press Freedom Index is Indonesia with a score of 124. At least 10 journalists have been killed there since 1996, with the CPJ saying eight were targetted for murder, with seven of the deaths failing to see anyone held accountable.